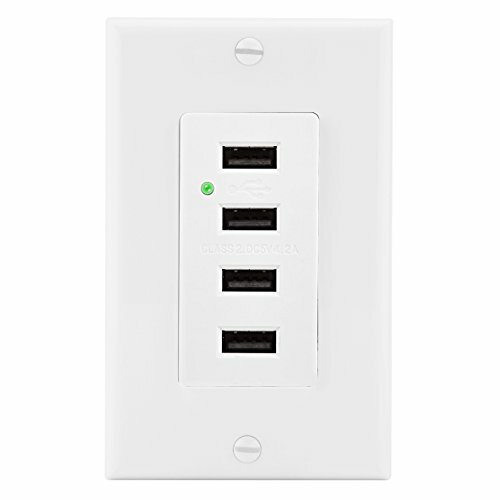 The Bestten 4 USB Charger Receptacle offers FOUR USB charging ports. It is an ideal solution for creating a centralized USB charging station for commercial and professional workplaces as well as high-end offices and houses. This receptacle is a replacement of traditional duplex receptacle. It is able to charge 4 USB devices simultaneously, including smart phones, tablets, e-readers, cameras and MP3 players without adapters minimizing clusters. What's more, it has the capability to charge new device required higher current rating up to 2.4Amp. Like traditional receptacle, the installation only needs to loose and fasten the back and side wires. Please read user manual for details. Fireproof poly-carbonate housing keeps you away from fire risk. The product has got UL certification.